To be unveiled in India shortly, the Hyundai Venue compact SUV will also be making its international debut at the New York Auto show. 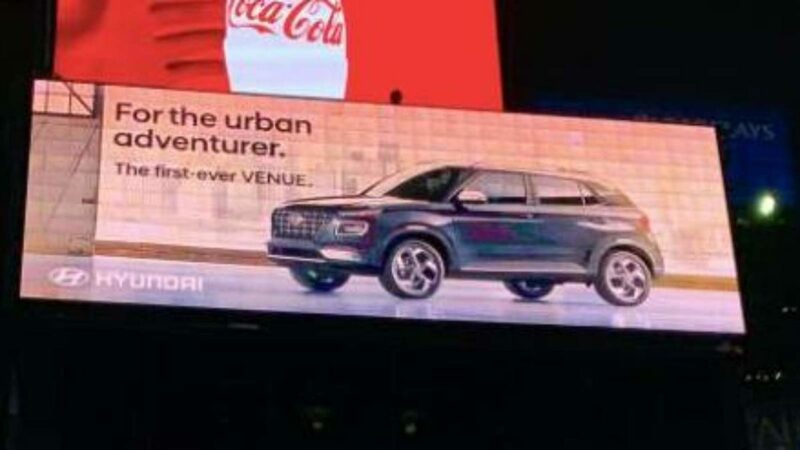 Ahead of the unveiling at this coveted show, Hyundai has showcased a rather large advertisement, revealing the SUV. 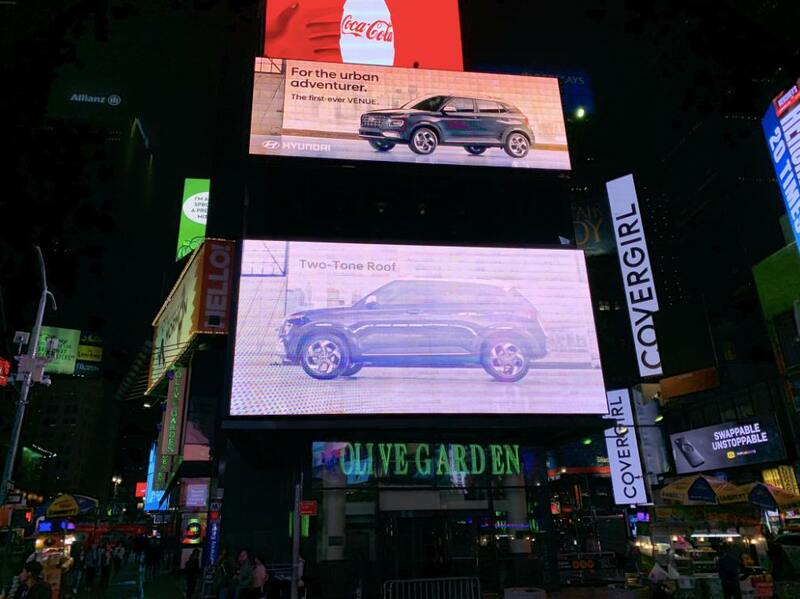 This advertisement can be seen at one of the most visited locations in the USA, Times Square in New York. 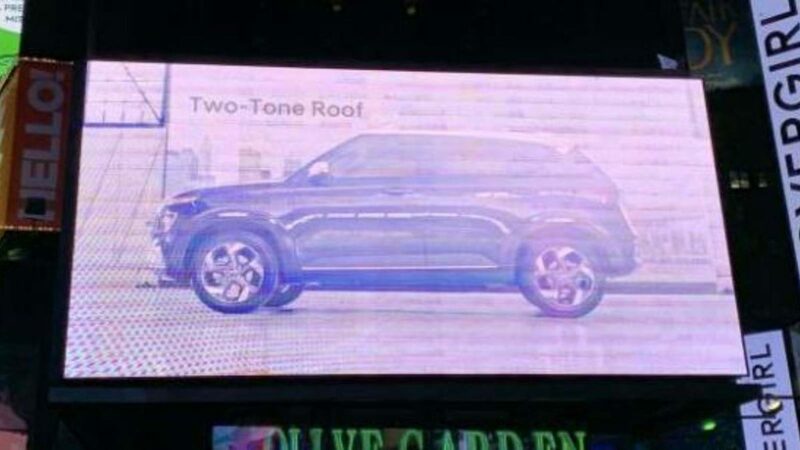 In these images, we see some features of the upcoming SUV and the side profile of the car. The car, in the US market, will be offered with a dual tone paint scheme and alloy wheels, very similar to the ones seen in the Creta. Have a look. Aimed against the likes of the Tata Nexon, Maruti Suzuki Vitara and the Mahindra XUV300, the Venue is expected to bring a number of first in segment features. Till now, Hyundai has revealed that the car will come with BlueLink connectivity which has 10 India specific functions. Just like the case is with every Hyundai in the market, the Venue too will offer keyless ignition, automatic climate control, touchscreen infotainment and much more. In the spy shots that were leaked not too long ago, we could confirm the presence of some of these options. Under the bonnet, the Venue is expected to be offered with three different engine options. There will be 2 petrol motors, an enthusiast-oriented 1-litre motor and 1.2-litre petrol. While the latter will be offered with a manual gearbox and a conventional auto box, the former will be paired with a dual-clutch automatic transmission. The third option will be an oil burner, with a capacity of 1.4-litre. Hyundai is also preparing its dealership network to handle queries and questions related to the BlueLink app. The company will be training a team of over 650 Blue Link Wizards who would be specialists in their field and who in turn will train over 10,000 Sales Consultants across the wide network of Hyundai dealership and service touch points. We shall be bringing you detailed coverage of this compact SUV from the unveiling ceremony, stay tuned.